The atmosphere at the beginning of this heart-stopping novel is oppressive, and it only grows more claustrophobic as the story unfolds. 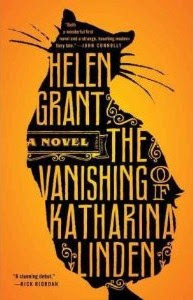 THE VANISHING OF KATHARINA LINDEN is a kind of hybrid thriller-fairytale, and Helen Grant treads the line between the two with delicate skill. The narrator of the story is, unusually for a YA novel, a 10-year-old girl – though she’s looking back on events from the age of seventeen. Surprisingly, this works very well on all kinds of levels; Pia’s voice is a blend of wide-eyed innocence and horror with the knowingness of later experience – and the first-person narrative does nothing to diminish the tension. Girls are vanishing in the small town of Bad Munstereifel and Pia, like any self-respecting heroine, is determined to solve the mystery, win the admiration of the whole town, and erase her family’s reputation as The Ones with the Exploding Grandmother. 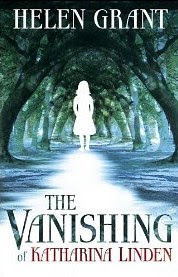 Woven into this very contemporary mystery are local legends of ghosts and witches, as told by the genial Herr Schiller to Pia and her only friend Stefan. These are terrific self-contained tales (though they are of course very relevant to the denouement) and until close to the end of the book, I was still wondering if the puzzle’s solution would have an occult element. That’s how seamlessly Helen Grant weaves her story threads, and she does it in a poetic writing style that echoes fairytales. Grant is also a genius at evoking a small and isolated community – the closeness and mutual supportiveness, and the perilous gossip and groupthink. Despite its prettiness Bad Munstereifel made me shiver, and not only because of the terrible events that take place. It’s a real place and Helen Grant used to live there – like Pia’s exiled English mother, who rages against her restricted options in this small town – and I’d love to know how Bad Munstereifel has reacted to its depiction, both positive and negative. The denouement kept me up very late, piling horror upon ghastly horror, but the ending was entirely satisfying without being simplistically ‘happy’. A final mystery: why doesn’t the Amazon listing display the very beautiful cover that’s on my copy? Never mind. Wearing any outfit, Katharina Linden is a gripping, terrifying, and lyrical read. Mmm! I read this one too, recently. Loved it. Although I did think the heroine perhaps unbelievably tough towards the denouement. My daughter read it and exclaimed, "I'd have been howling 'I want to go home!'" She liked it too, though. I've just started The Glass Demon! I can tell I'm going to be drawn in just as I was with Katharina Linden. Thank you for your comments, guys! Kath, I know what you mean - but (without spoilers) I accepted it because she'd just been through such a hideous experience, I could believe she'd think nothing worse could happen - at least, nothing worse than anything her own fear could conjure... Brrrrrr! It was definitely a good book, and for anyone who likes books that get under your skin and spook you, you can't go wrong with this one. I'd also consider it to be one of those rare books that both adults and children can enjoy, perhaps equally, although I would be hesitant letting a very young child read it. I'd say for ages 12 and up.